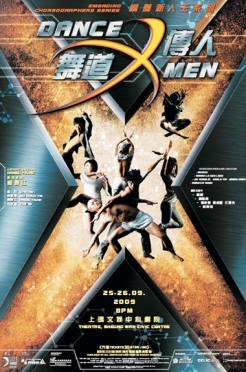 Hong Kong Dance Alliance brought to the dance community and dance enthusiasts the Dance X Men to promote artistic exchange in dance. Emerging Choreographers Series: Dance X Men aims to encourage collaboration between dance artists, dance groups and other art forms in pursuit of creative synergies. Proposals from dance artists and dance groups were subjected to a meticulous selection process and four collaborative combinations were eventually chosen to create and present a dance piece of less than 20 minutes each. Daniel YEUNG, Artistic Director of the project, and mentors MUI Cheuk Yin and Yuri NG offered invaluable advice and guidance to these emerging choreographers over the course of their creative process. This project to nurture the development of a new generation of choreographers is presented by Hong Kong Dance Alliance, partnered with The Hong Kong Academy for Performing Arts and commissioned by Hong Kong Arts Development Council. Dance Enhance is a project to encourage dance appreciation and criticism. A pilot workshop co-presented with the International Association of Theatre Critics (Hong Kong) kicked off in Feb 2009. The programme provided a platform for sharing and critical review for participants where they could exchange views, open up discussions, and publish reviews on various forms of dance. Tickets were provided for participants and in addition, well-experienced dance critics, choreographers, and dancers shared their perspectives with participants. They included Prof Anita DONALDSON OAM, Dr. CHEUNG Ping Kuen, Anna C Y CHAN, Stella LAU, Kuh Fei, CHOW Fan Fu, and more. Performance tickets and venue for the project were sponsored by Hong Kong Dance Company, The Hong Kong Ballet, City Contemporary Dance Company, and the Hong Kong Academy for Performing Arts. The project lasted for 4 months. It was divided into 3 sessions for altogether 11 classes. 30 participants attended the workshops, performances, pre-talks, post-talks and criticism sharing sessions. They should prepare an article (not less than 1,000 words in Chinese or English) after viewing each performance. Articles were sent to senior dance critics or mentors for further reference and comments. 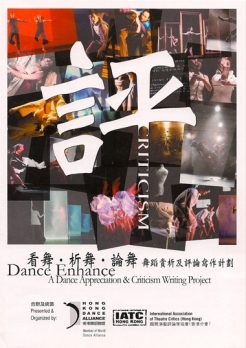 Selected outstanding articles were published in dance journal/hk and the Hong Kong Dance Alliance website.